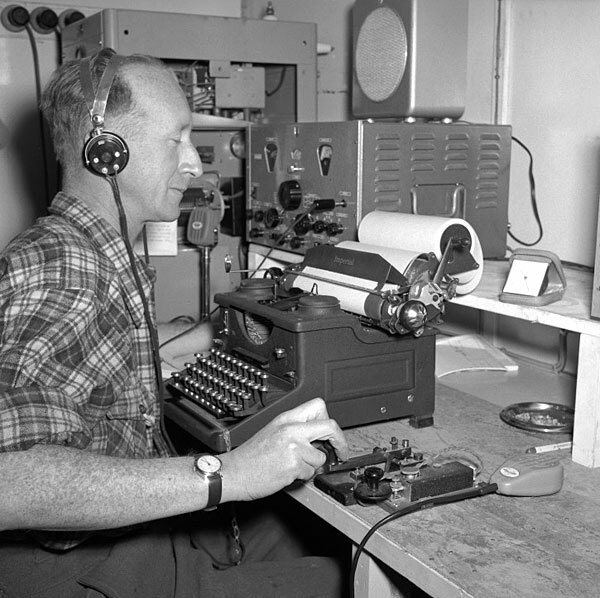 In 1957-1958 the [New Zealand] Post Office was involved in providing radio and radiotelegraph links for New Zealand’s first Antarctic facility, Scott Base. 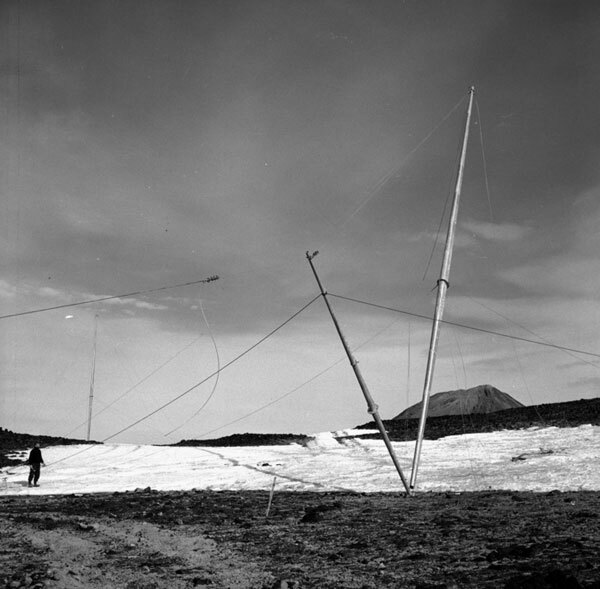 This had been established in January 1957, as part of the country’s contribution to International Geophysical Year (1957-1958). 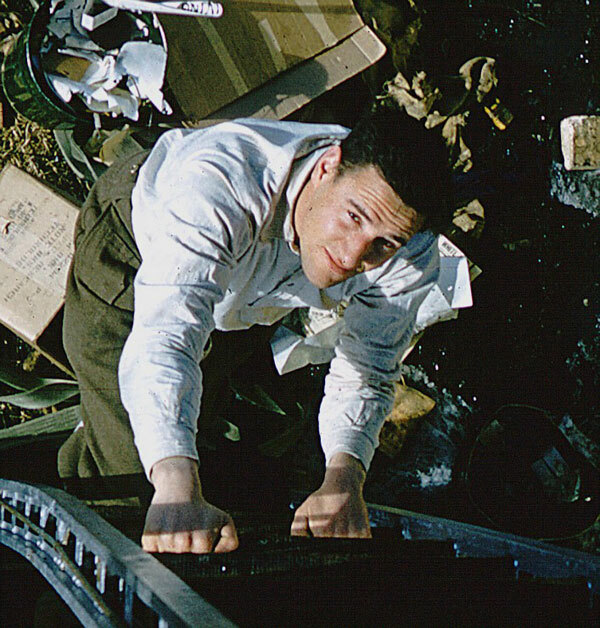 These links were used by the New Zealand team under Edmund Hillary participating in the joint Commonwealth trans-Antarctic crossing of 1957-1958 where converted tractors were used by Hillary as ‘Sno-cats’, hauling men and supplies. 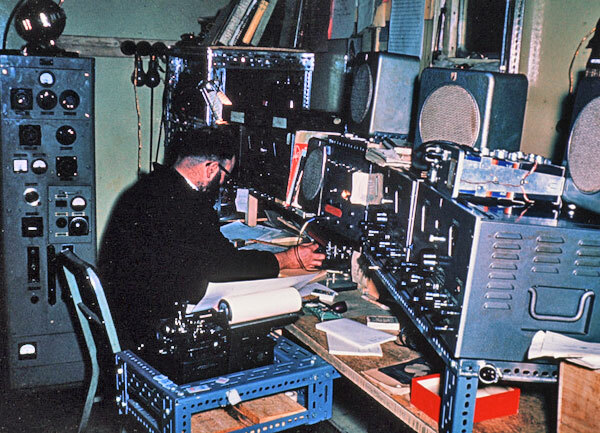 The Scott Base Post Office opened on 11 January 1957 and provided HF radio communications using callsign ZLQ. 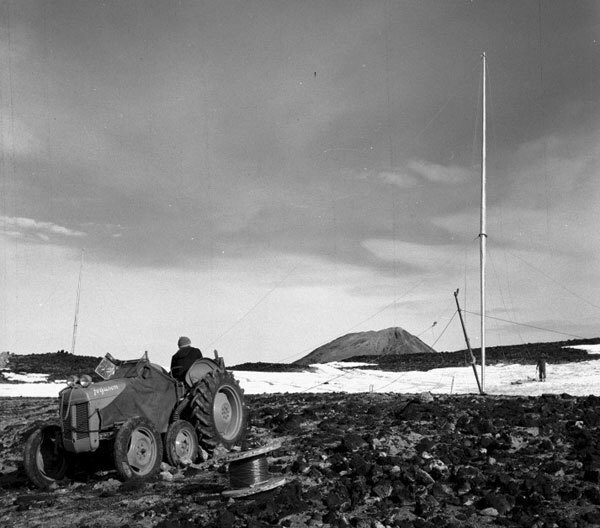 Cape Hallett Station, a joint US-NZ base, was also established in 1957 as part of the International Geophysical Year, and was permanently staffed until 1964. 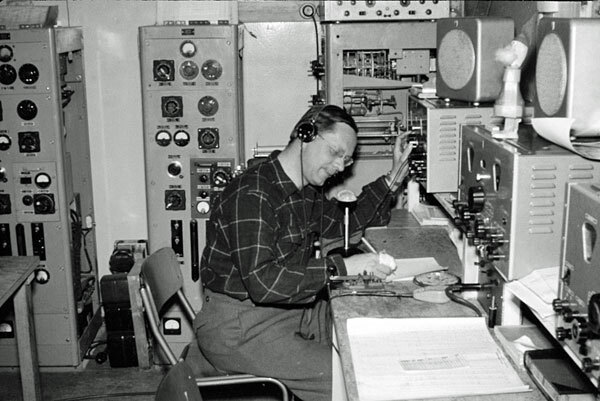 Scott Base radio room 1959-1960. 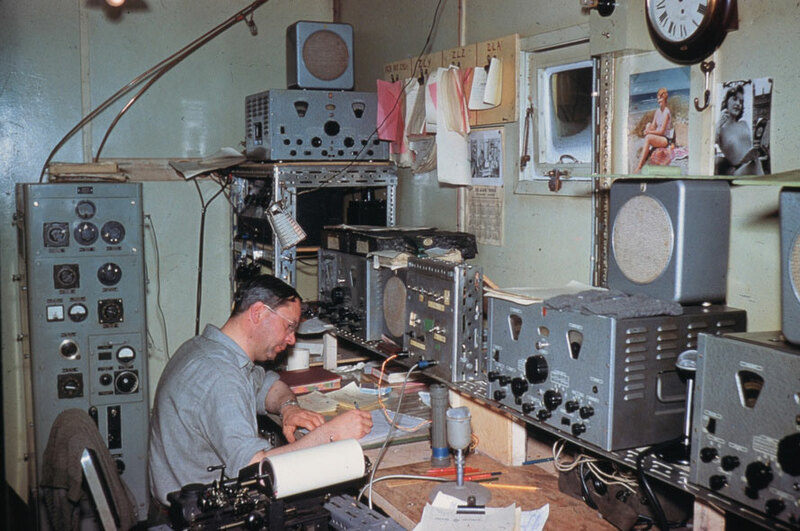 Some interesting details in this photo: the operator’s mittens drying out on top of the receiver, the clipboards on the wall for stations ZLY, ZLZ and ZLA, and the pin-up photos. Well it was 1959 after all. Photo: J Lennox-King, Antarctica NZ. Click to enlarge. 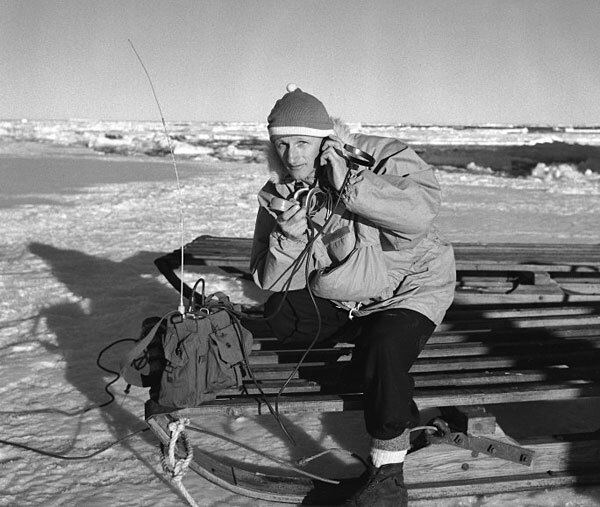 1 Peter Mulgrew became the commentator on Air New Zealand scenic flights over Antarctica, and died in the Erebus crash on 28 November 1979 at age 52. 2 Wilson, A.C. (1994). 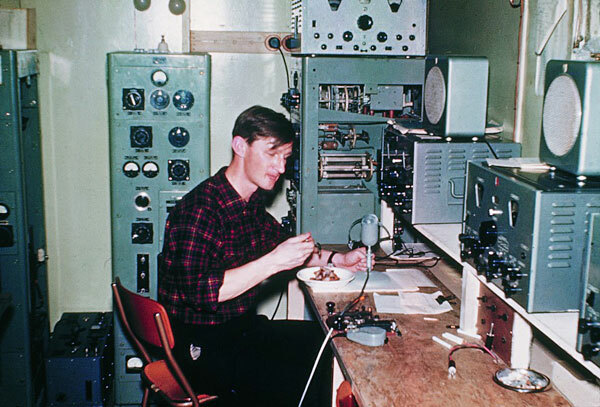 Wire and wireless: A history of telecommunications in New Zealand 1890-1987, (p 167), Palmerston North, New Zealand: Dunmore Press.